My favorite American foursome in Boston-based Jada are going full steam ahead with their brand new EP release, now available on iTunes and Amazon! 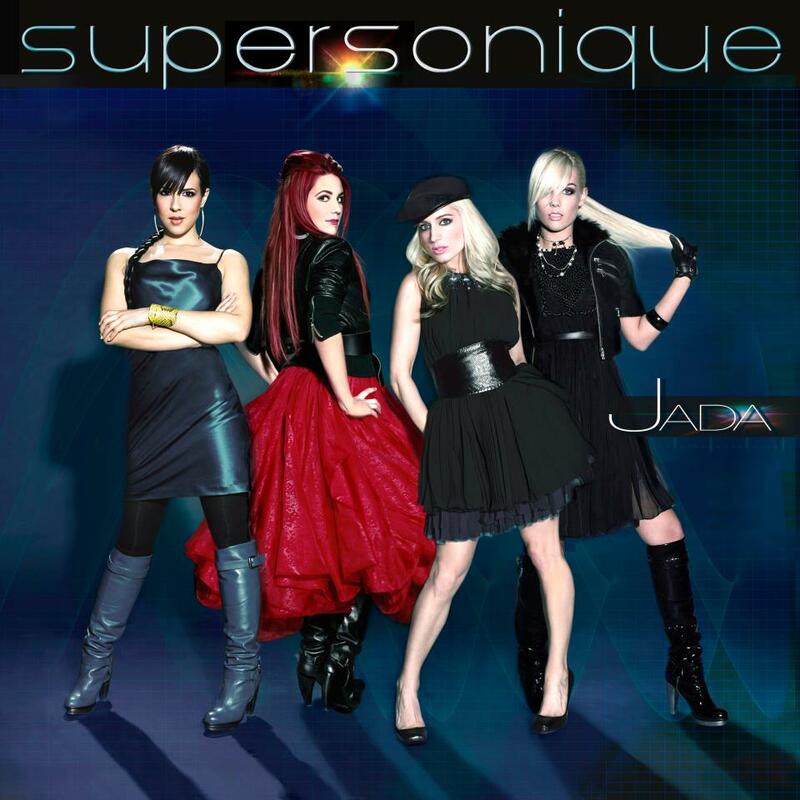 The set is titled Supersonique, after their new single to followup last year's "This Party's On Fire" (which is included in its original form, along with an "extended" remix), and also contains three other brand new cuts. All of the new cuts, along with "This Party's On Fire" were produced by up and coming producer (and Boston's own!) RIO, and were co-written by the Jacyn, April, Lauren & Elle (see left to right in the cover art you see to the left) themselves. The genres represented are a good smattering in sound, not totally unlike Jada's previous releases in the RedOne-produced uptempo "American Cowboy" and tear-jerking mid-tempo ballad "Break Up Song". 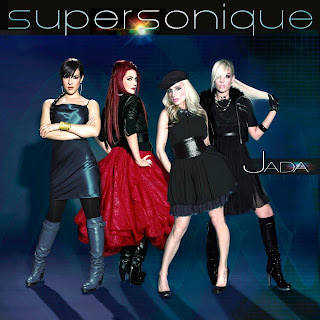 Supersonique takes Jada's ease with genres and runs with it, with very good results in a very short span of elapsed playing time. The single, "Supersonique," is a sky-high, energetic, synth-stomper that was clearly designed for club use, completed by the drawn out "Take me away..."s in the chorus. The song is currently knocking on Top 10's door at Fusion Dance Radio, based in Chicago. "Can't Let Go" (described as an "homage to Ne-Yo") is a fun mid-tempo with a walking beat, perfect to tap your foot to. With each successive chorus, the harmonies build, creating a natural crescendo. It's the first real hint of what makes Jada unique -- their four-part harmony sound pyramid. My personal fave of the set is the dark but still sparkly "Mercy Killing" -- spouting venom at an ex who's too interested in the scene over the romantic experience. The song is so good, it appears on the EP twice (and for good reason). The original version is complemented with the "Extended Intro" Remix, which in this case would be better named as an 'Extended Club Remix' (which includes a really great acapella bit close to the two-minute mark). If the group wanted a truly radio ready cut, look no further than either version of this gem. "I think this relationship's gonna need a mercy killing to end it all," the chorus coos. By the time the bridge is called up, the melismas scorch and the lyrics get even grittier. "...Every little memory of my pain with you is now decayed and scattered/I don't need a requiem/No symphony of sadness...Mercy, Mercy/Gonna wash your stain away..."
Honestly, I can't decide whether I like the original or the "Extended" Version best. The set comes to a natural close with a requisite R&B ballad - the beautiful and relatable "Goodbye" which is the perfect reflection of Jada's trump card. This piano-based ballad is gorgeous in its simplicity, complete with layered harmonies in the bridge. This is the song the group should use as an acapella piece to dazzle at live performance opportunities. It's clear the arrangement was crafted to be very subtle so the main focus was on the gorgeous rounds created by these four women's voices. If you read this column often, you'd know I tend to gravitate to uptempos much more often than to ballads, but when a ballad is done very well, I find it very difficult to move on to other material, and such is the case with "Goodbye". As for "This Party's On Fire", you can watch the music video here. You can listen to snippets to all of these cuts at Jada's official website. You can also read my interview with Jada during their "American Cowboy" era from mid-2009(!) here. Do your part to support quality indie pop and purchase the entire Supersonique EP for less than $7 at iTunes or Amazon now. love your blog! Great music site! Jada IS Supersonique! Can't get enough of their music, so glad this ep came out! What A great group! i found JADA online last year and have been thirsting for some new tracks from them--this new EP is amazing and PS I love your blog! I Love Jada! You can request them on partyradiousa.net internet radio!